ALL NEW Vitamix Ascent A3500 Review! THE MOST BEAUTIFUL AND INNOVATIVE VITAMIX PRODUCT EVER! Purchase the all new Vitamix Ascent A3500 thru Blending With Henry and enjoy free shipping! Canada Customers click HERE to order and get fast free shipping! At first glance I was blown away at the overall design of the Ascent Series. I wasn't quite sure that I was looking at an actual Vitamix machine. After my "starstruck" reaction wore off then I said "Oh, it's a square shaped Vitamix!" I have been accustomed to the design, fit and finish of the Vitamix Professional Series 750 and the Classic Series such as the Vitamix 6300, so the Ascent Series was a complete change and somewhat an acquired taste like a fine wine, and that's not necessarily a bad thing. In my eyes it's a thing of beauty for sure. The back of this machine is equally as beautiful with attention to detail as the front. So what's new about the Ascent Series over the previous/existing line of Vitamix machines? The Ascent Series is the foreseeable future of Vitamix. It's a lifestyle machine that may satisfy many types of aspiring chefs, a novice in the kitchen or the person who enjoys the future of tech. Like the 780, the A3500 offers touch panel blending. Like the Professional Series 750, the A3500 offers full manual operation with the variable speed control knob. Unlike all previous home Vitamix machines the Ascent A3500 offers full digital display with an electronic timer to monitor blending time, 5 presets, programmable timer and touch screen operation. No other previous Vitamix offers this combination of features. I simply cannot write this review without recognizing the new variable speed control knob on the A3500/A3300. It's so buttery smooth it can be operated with just a simple roll of your index finger. It's a rotary knob like you would find in a high-end car audio system and the moment you give it a spin you will quickly realize your money was well spent. A NEW ASCENT CONTAINER THAT CONNECTS WIRELESSLY! AREN'T THEY ALL "WIRELESS"? When Vitamix introduced the next generation machines such as the Professional Series 750 they also introduced a new low profile container with benefits. Owners of the Classic Series machines wanted to use this container, but it was not compatible. Although it did fit on the classic series base and still allowed "blending", there were possibilities of future issues due to incompatibility. The Ascent Series now offers a new designed container with Self-Detect technology. When placed on the Ascent motor base the Ascent wirelessly detects which container is being used and adjusts speed settings so proper blending takes place. If an incompatible container is used the Ascent will not activate. This is also beneficial for making sure the container is sitting properly in place and coupled to the gears on the motor base. The new 64oz Ascent container comes with a clear lid for easy viewing of ingredients blending from the top that snaps in place for added security. long Included is a new lid plug that doubles as a measuring cup for adding small ingredients such as spices and flavorings. A new pour spout design helps to pour blends much better and the bottom is now square in design for much easier cleaning. This is a vast improvement over previous versions. Coming soon, or by the time this review gets very popular, there will be other Self-Detect blending containers for the Ascent Series such as the 20oz single-serve cups to take on-the-go and the 8oz cups which are perfect for making baby food, dips, spreads, quick chopping and milling herbs and spices. These new containers and cups come with blending blades and blend directly on the Ascent Series motor base. They are fully dishwasher safe, including the blades however I personally prefer hand washing. With all these blenders with timed presets on the market, the one thing holds true, presets don't always get the job done perfectly. This is because presets are not designed to change functionality based on what you're blending and they stop automatically even if your blend isn't complete to your satisfaction. Unless you create your own blend that happens to work perfectly with the preset on your Vitamix you may end up with mixed results. The Ascent Series solves this issue with the Programmable Timer feature (on select models). For example, in the above photos I create one of my new series of Expression Smoothie Bowls. The smoothie mixture can be a hit or miss if not timed perfectly while blending. My smoothie mixture took 52 seconds to create the perfect texture. I simply touched the Up/Down buttons until the timer read 52 seconds, then touched the start button. I quickly ramped the variable speed control to the highest. It stops automatically when the timer reads zero. Same scenario with my Herb Infused Creamy Sweet Onion Soup. I set the timer for 3:00 and ramped up to the highest speed. 3:00 creates the perfect blend of my soup. The soup preset takes 5:45 to complete, which would've over-blended my soup, unless I stopped it manually which would require me to stand to the Vitamix and monitor the blend time. Being able to set your own blending time now means two people may blend the same recipe ingredients but have different texture preferences which would require different blending times. Another benefit of the programmable timer is your blend will always be 100% perfect every time. The Programmable Timer function allows for set and walk-away blending. It's a must have and this feature puts select Ascent Series models ahead of the game! Every Ascent Series machine includes the all new Simply Blending recipe book that is dark and beautiful and is designed as a "Lifestyle" book. The recipe designs are created for many types of lifestyles, whether you're a person who is more "outdoorsy" or enjoys recipes in the comfort of their own home with friends. Simply Blending should satisfy the most culinary conscious personality. Some people may brush off the idea of using the auto-cleaning setting on the Vitamix since you can simply fill the container half full with hot water, add 2 drops of dish soap and ramp it up to high speed. Yes, that works but is it truly effective and efficient? Select Vitamix Legacy machines have a self-cleaning function and I have used it, but I have found that they blend for 1 minute at the highest speed and sometimes soap begins to seep out from the top of the lid plug. The Ascent Series has been completely reprogrammed to do cleaning the right way. The Cleaning preset is set for only 35 seconds. The Ascent cleans at multiple speeds and I like how you can now see the lid being cleaned due to the clear design. What I found interesting was using the same 2 drops of dish soap as with Legacy Vitamix machines produced far more suds in the Ascent A3500 and it's cleaning at lower speeds and a shorter time than the Legacy Vitamix machines. Vitamix certainly is performing some type of magic and I like it. Vitamix created 4 Ascent models to satisfy most consumer's blending needs. Each model shares the main features of Digital Timers and Wireless Connectivity for compatibility with the Ascent Self-Detect blending containers and optional accessory cups. 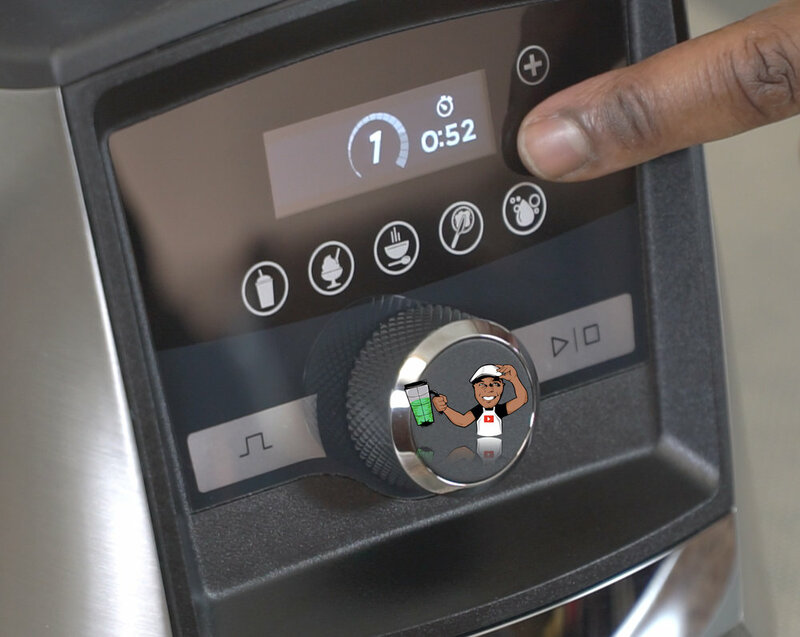 A3500 is the top of the line with touch screen controls, digital timer, variable speed control + pulse, 5 presets, programmable timer and premium brushed stainless styling. Blending With Henry recommends THIS model for the chef at heart who needs to fully customize their blends. A3300 introduces all of the above less the 5 presets and premium styling. A2500 is an excellent balance at an affordable price. It includes 3 presets, variable speed control and digital timer. A2300 is the most affordable and offers the same features as the A2500 less the 3 presets. Blending With Henry recommends THIS model for all purpose blending for all types of users. Vitamix has consistently provided a generous warranty on their products. The Legacy models have either a 5 year or 7 year warranty. Upping their game they included a full 10 year warranty that includes free shipping back and forth for service on the new Ascent Series models and it covers normal wear and tear. Unlike it's nearby competitors Vitamix also covers the included containers within the 10 year warranty. I honestly found this to be of no surprise as Vitamix machines have been well known to last 2-3 times longer than their included warranties. For me personally, Vitamix addressed many of my own blending needs and wants in their new Ascent line of products. I always hoped for a digital timer so I can keep track of my blending times and I love the feature of Self-Detect containers, especially the Self-Detect 20oz and 8oz blending cups. I was quite impressed on the sound. While all Vitamix home machines are capable of waking up the heaviest log sleeper in the morning, the Ascent definitely is a step forward with it's built-in sound dampening materials. Maintaining a conversation while blending with the A3500 was very possible without raising voice levels. First time Vitamix buyers may enjoy the Ascent Series machines right out of the box with no need to adapt to new technology. Owners of Legacy Vitamix machines, such as the Professional Series 750, who are thinking about "upgrading" to the Ascent Series should be aware that any accessory containers purchased for their Legacy machines, such as the 32oz Wet or 32oz Dry Grains containers, will not be compatible with the Ascent Series machines. At the time of this writing there are currently no such containers for the Ascent Series that replicate or replace the legacy-compatible 32oz Wet and Dry containers. The included 64oz containers with Legacy Vitamix machines are also incompatible with the Ascent Series. Vice versa, the included Ascent Self-Detect 64oz containers and the Self-Detect 20oz and 8oz containers are not compatible with Legacy Vitamix machines. Who is the Ascent Series currently best suited for? Anyone who is ready to move forward with cutting edge technology. This series of Vitamix machines are the way forward for the company, however potential buyers should be aware that moving forward with new technology comes with patience, and certain blending needs may not be satisfied right away which is why the Legacy Series of Vitamix machines may currently be the right products to choose for many people, while they remain in circulation. I love the new Vitamix Ascent Series of products and the A3500 addresses nearly everything I could've asked for in the world of blending. Is the Ascent Series perfect? Nothing is perfect. Will the Ascent Series address everyone's blending needs? Perhaps not. What do I feel may be missing in the Ascent Series? I would've liked for Vitamix to have created the new Self-Detect containers with printed measuring lines. The translucent measurements become difficult to view especially once the container is filled with ingredients. Is the Vitamix Ascent Series for me personally? Yes! I love tech, I love moving forward with technology. It presents improvements, and with consumer feedback it helps companies address the needs of future customers. Please feel free to leave comments below and ask me questions about the new Vitamix Ascent Series. You may also reach me via email HERE. CHOOSE YOUR VITAMIX ASCENT SERIES MODEL HERE AND ENJOY FREE SHIPPING THROUGH BLENDING WITH HENRY! Please subscribe to Blending With Henry for future updates, exclusive recipes and tips!. Note: Vitamix provided the Ascent A3500 to me as a courtesy with no influence on my review. Sign up with your email address to receive updates on deals, special recipes, blending tips and giveaways! BLENDING WITH HENRY IS FINANCIALLY SUPPORTED ONLY BY THE AWESOME AND LOYAL CUSTOMERS WHO PURCHASE VITAMIX AND VARIOUS OTHER PRODUCTS FROM THIS SITE.